Eczema News – Do Elimination Diets Work? 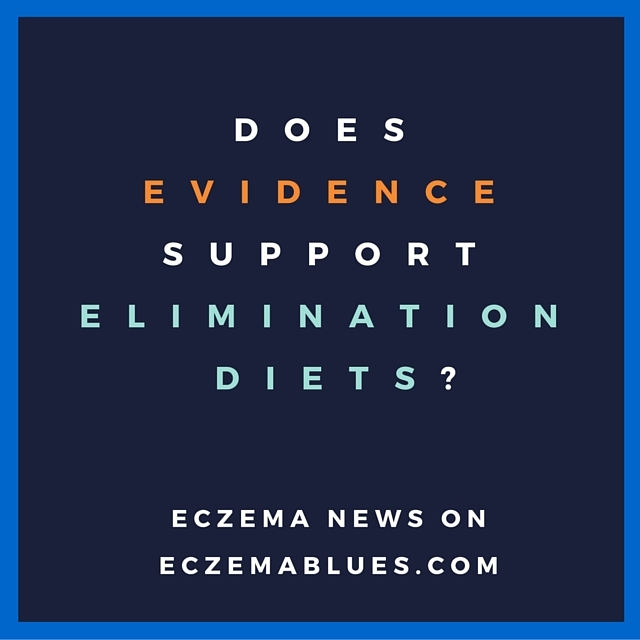 Posted byMei 18 November, 2015 19 October, 2015 1 Comment on Eczema News – Do Elimination Diets Work? (Scenario 3) eliminate such foods without testing for allergies, either because doctors didn’t recommend allergy testing or such facility is not easily available where the family lives. The question then is whether Scenario 2 and 3 are valid for parents trying out elimination diets for their child. A paper published in July 2015, in the College of Family Physicians of Canada sought to study the papers that have been published on elimination diets, specifically with regard to eliminating eggs and cow’s milk. Result of study: There is insufficient evidence about the benefit of eliminating cow’s milk in unselected patients with atopic dermatitis (AD). Some evidence suggests that egg elimination might benefit those children with AD who are suspected of being allergic to eggs and who are sensitized to eggs. I’m a supporter of allergy testing, simply because given that tests are fairly accurate and you can always take a few tests at different development stages of the child to corroborate what he is allergic (or not allergic to), I feel that taking allergy test beats the worry that comes with second-guessing. It has been covered in this blog before on the possibility (and doctors are accepting that possibility with more research) that food sensitization can come from outside-in: meaning it is the defective skin barrier that allows food allergens in the air (on the skin) to result in the body being sensitized to the food allergen. It reinforces the importance of protecting the child’s skin barrier with good skincare routine, even from birth for infants at high risk. Elimination diets rely on observing if there’s any change in the skin/ increase in rashes after consumption of food. However, this can be misleading because (i) allergic reactions may not show up immediately and (ii) prevailing allergens such as to house dust mite can ‘confuse’ the observations because it triggers eczema flares from time to time. It is mentioned in the paper that “40% to 90% of infants with moderate to severe AD are food sensitized based on positive results of skin-prick tests to 1 or more food allergens” but “only 35% to 40% of food-sensitized children with AD have clinical signs and symptoms of food allergy according to multiple double-blind, placebo-controlled food challenge studies“. This means that it is more likely that a child will be tested positive to a food that he can actually consume and not trigger a food allergic reaction. As such, it seems to not justify eliminating a food when it is not even tested positive in the first place. There were two studies mentioned in the paper that reported an improvement in eczema after elimination diet, (i) was eliminating eggs for infants who are sensitized to eggs, and (i) was using hydrolyzed milk. Nutritional deficiency – the paper mentioned that calcium, vitamin D and E were deficient. Turning intolerance due to elimination – the paper mentioned that early low-dose cutaneous exposure to food allergens leads to allergic sensitization, whereas early oral consumption of food proteins induces immune tolerance. This means that taking a food, suspecting it is an allergen for the child and eliminating it, make it more likely to have a food allergy as opposed to not eliminating that food. The above is why the medical community generally only recommend elimination diets when tested positive, and after reviewing various test results and understanding the roles that other allergens play. When evaluating all the double-blind placebo-controlled food challenges, only about 6% of the children with eczema had a reaction to the suspected food allergen. It is therefore, more likely than not, that the eczema rash is not due to the suspected food. What’s your experience in elimination diet? Has it improved your child’s eczema? Do share in the comments especially when many parents are interested in how other eczema families cope with diet.